From the jacket copy. Who Owns Native Culture? documents the efforts of indigenous peoples to redefine heritage as a proprietary resource. Michael Brown takes readers into settings where native peoples defend what they consider their cultural property: a courtroom in Darwin, Australia, where an Aboriginal artist and a clan leader bring suit against a textile firm that infringes sacred art; archives and museums in the United States, where Indian tribes seek control over early photographs and sound recordings collected in their communities; and the Mexican state of Chiapas, site of a bioprospecting venture whose legitimacy is questioned by native-rights activists. By focusing on the complexity of actual cases, Brown casts light on indigenous claims in diverse fields—religion, art, sacred places, and botanical knowledge. He finds both genuine injustice and, among advocates for native peoples, a troubling tendency to mimic the privatizing logic of major corporations. The author proposes alternative strategies for defending the heritage of vulnerable native communities without blocking the open communication essential to the life of pluralist democracies. 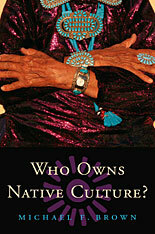 Who Owns Native Culture? is a lively, accessible introduction to questions of cultural ownership, group privacy, intellectual property, and the recovery of indigenous identities. Author’s comment, 2014. WONC? is intended to be an accessible, sympathetic portrait of the efforts of indigenous peoples to reassert control over their intangible cultural productions and sacred sites, many of which have been appropriated and in some cases desecrated by more powerful outsiders. The book is not a study of the repatriation of physical objects such as human remains. Instead it looks at how the logic of repatriation is increasingly applied in such fields as religion, music, art and traditional knowledge. What makes WONC? controversial in some quarters is that it does not automatically agree with the most radical of Indigenous claims–for instance, that elements of traditional culture long in circulation globally can somehow be “repatriated” to communities of origin. Instead, it considers (1) whether proposed strategies for ending cultural appropriation can be made to work in the real world; (2) whether the logic of repatriation as applied to physical objects readily applies to cultural productions that are easily digitized, broken up into fragments, and instantly distributed via electronic media; and (3) whether the potentially negative impact of certain forms of cultural protection outweighs their advantages. The book’s principal ambition is to nudge debate about cultural property beyond the sloganeering that so often characterizes it. And like most of my work, it pays homage to the Law of Unintended Consequences–that is, how ideas and policies that seem persuasive in theory often spawn undesirable effects and create new problems. Who Owns Native Culture? has been widely adopted as assigned reading for university courses in law, Library Science, Museum Studies, Native American Studies, and anthropology. Excerpts of reviews can be found here. Richard A. Shweder reviewed the book in the New York Times Book Review, and a comprehensive list of other trade and academic reviews, mostly available full-text, can be accessed in the Who Owns Native Culture? website at Williams College, which for over a decade tracked developments in cultural-property research and policies. For sophisticated, nuanced, and participatory research that shows how far the struggle against cultural appropriation has advanced in recent years, visit the website of a major project based in Canada, Intellectual Property Issues in Cultural Heritage (IPinCH).